April Thomson specializes exclusively in aesthetic injectables and CoolSculpting. April has been injecting all day, every day for more than a decade. She believes that specialization is the key to providing exceptional results. 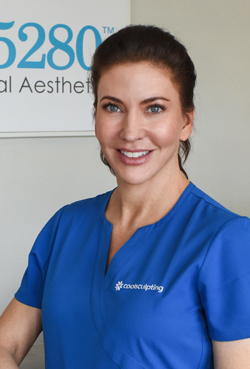 April has undergone advanced training in injectables and CoolSculpting, and for many years she worked for some of the best Plastic Surgeons in Denver. 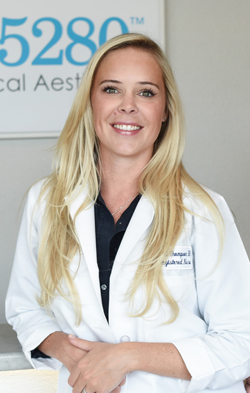 April started her career gaining experience in Plastic and Reconstructive nursing in private practice and the operating room, before specializing in aesthetic injectables and CoolSculpting. April’s attention to detail, understanding of anatomy and musculature, coupled with her aesthetic eye is truly her trademark. It is these qualities that set her apart from other providers, and keep her patients coming back. April does not believe in a ‘one-size fits-all’ approach. Instead, she conducts a careful assessment and tailors her patient’s treatments to their specific needs. April also has a passion for injecting Voluma, a dermal filler which has become one of the most popular treatments at Injector 5280. Through April’s vast knowledge, training and injecting experience, April has also become an educator and trainer for other Aesthetic Injectors. With a commitment to ongoing education, April follows the medical aesthetics industry closely and remains on the cutting edge of new injectable and CoolSculpting technologies. April’s objective is to offer you the highest quality treatments available and ensure you receive the finest results possible. Kellie has a wealth of knowledge and experience in the aesthetics field – she is a tremendous resource as our Director of CoolSculpting. Kellie is a Body Contouring Expert with extensive CoolSculpting experience and has undergone advanced training. Kellie has spent two decades working for some of the top hospitals and medical practices in the country focusing on medical imaging archiving technology. This diversity has given her a unique perception on how to work with a patient pre, during and post care. She prides herself that we have an exceptionally high patient satisfaction rate and that our practice is a recognized Premier CoolSculpting Practice. Kellie believes in each patient and their personal goals and strives to help them achieve and be their best. Kellie never tires of helping people of all ages achieve their desired aesthetic outcome. Kellie is known by our patients to be kind, caring, and someone who truly listens. She will spend time with you to define your aesthetic goals and help you understand your CoolSculpting options. Kellie puts your health, comfort and importantly, your results as her top priority. Kellie is also extremely knowledgeable about our other treatments, including aesthetic injectables at Injector 5280. Call Kellie today or come in to see her for a complimentary CoolSculpting consultation. With Kellie’s expertise you’ll get the CoolSculpting results you’ll love! Sarah has extensive experience and specialized training with injectables, and medical aesthetic skincare procedures. Sarah has a keen eye for aesthetics, and loves to help her patients achieve their desired goals. Sarah also has several years Nursing experience in Plastics and in the Operating Room. Sarah is understanding and compassionate, and works with her patients to provide the best possible injectables experience and results. Committed to providing the highest quality patient care, Sarah continues to pursue additional training in new techniques and technologies. Book an appointment with Sarah, today – You are in good hands. Karen has been in medicine for over 15 years and in medical aesthetics for over 9 years. Karen is a Certified CoolSculpting Technician and continues her education to stay on top of the aesthetics field. Karen is very results orientated and her goal is to provide the highest quality CoolSculpting treatments to her patients. It is evident that Karen has a passion for CoolSculpting and her role in our professional and caring environment. Beth began her aesthetics career over 20 years ago working in New York City having moved back to Denver in 2012. She is, like all of the Injector5280 staff, highly experienced in the medical aesthetics field. 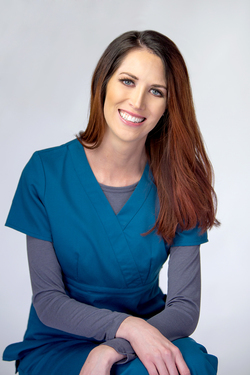 Beth has extensive experience in clinical skin care and is a true advocate for her patients. Beth has a diverse array of knowledge and experience as a certified CoolSculpting Technician and Paramedical Aesthetician. Will joins us from a prestigious plastic surgery practice in California. Will coordinates all of our business operations and public relations efforts. Will is committed to providing excellent customer service and strives to make every patient experience one of quality and comfort. Will is personable and professional and passionate about medical aesthetics. He desires to create a boutique atmosphere, while also maintaining our founding philosophy of meeting the individual needs of each patient.